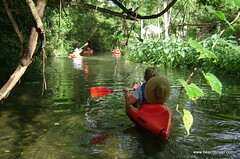 BeachnRiver Kayak Rentals had just officially opened for business April 2010 offering guests to the Alabama Gulf Coast an opportunity to kayak the beautiful Bon Secour River when it was nearly shut down due to the BP oil spill incident. Guests to the area were sparse. There were few options to enjoy spending time on area waters. 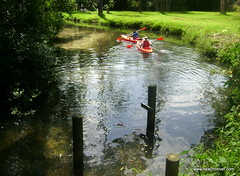 We had difficulty convincing people that at river’s end where we are located springs run crystal clear and kayaking is a great way to get out and enjoy a water-based activity. The Mundinger Family of TN and extended family of Baldridges of LA made a conscientious choice to support the struggling Alabama Gulf Coast and chose Gulf Shores, AL as their vacation destination. They also made a decision to look for alternate land and water-based activities to participate in while visiting. They came across “BeachnRiver Kayak Rentals” a little “mom and pop” operation that wanted to share their personal love of kayaking the Bon Secour River with the public. 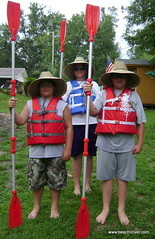 You could not imagine our joy when we received a phone call from Linda Mundinger stating she had a large family that wanted to kayak, swim and take advantage of our “boxed lunch” special — an arrangement we made with (now defunct) Lenny’s Subs to provide a Sub sandwich, chips, cookie and drink for under $10 per person. 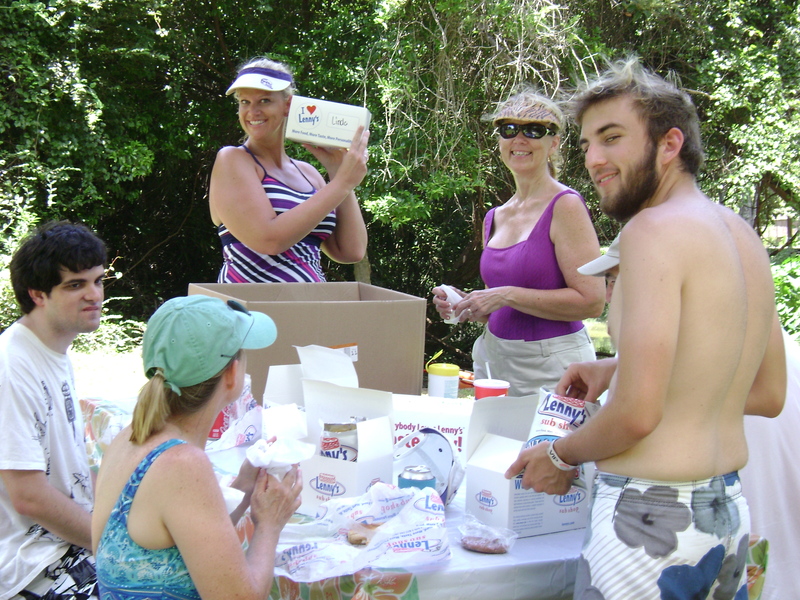 The Mundingers were BeachnRiver Kayak Rental’s first large group of the year to order custom lunches to be delivered during a kayak excursion. 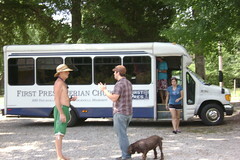 They paddled the river, took the opportunity to swim in some nearby swimming holes and brought a large cooler filled with picnic supplies to picnic on our grounds. River Rick erected a pop up shade tent and put two picnic tables underneath to accommodate the families. River Rick and Beachin’ Betty have faith they will. This entry was posted in Kayakers 2011 and tagged Baldridge, BP Incident, Chickens, Figi Dozen, Germano, Lenny's Subs, Mundinger. Bookmark the permalink. HEY ! its brooks mundinger , had alot of fun ! SEE YOU NEXT YEAR! Hello Brooks! We are OPEN and looking forward to seeing you and the fam again this year. We have planted new shrubs/trees with you and others in mind to keep you in shade while you enjoy your picnic.